If you need quick cash, a payday loan may not be the best option that you have. Many people turn to payday loans because they will allow you to get access to money almost instantly. However, there are several drawbacks associated with this type of loan. Here are a few things to consider before getting a payday loan. One of the major reasons that you should avoid payday loans is the amount of interest that they charge you. Most of the time, you are dealing with a short amount time with a payday loan. For example, the loan might only be for two weeks. Because of this fact, many people do not realize that the interest rates are that high. Nonetheless, when you calculate this out over the course of a year, the high interest rate suddenly becomes more apparent. 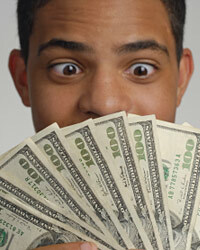 In many cases, you will pay more than 300 percent APR for a payday loan. This is astoundingly high compared to almost any other type of loan in the market. This means that if you take out a payday loan, you are paying much more than you should for the benefit that you are receiving. You need to ask yourself if paying over 250 percent more than any other lending option is worth saving yourself a few days. In the vast majority of cases, it will not be worth the cost. In addition to high interest rates, payday lenders often charge extremely high fees as well. You might have to pay an application fee, a processing fee, a set up fee, or some other type of fee that is associated with setting up the loan. In addition to this, if you are late on your payments, the late fees will most likely be very large as well. In some cases, you can accumulate more in late fees than the entire amount that you borrowed originally. This means that you need to understand the fees that you are paying before agreeing to a payday loan. Otherwise, you might get in over your head after the loan has begun. In some cases, payday loans will charge prepayment penalties as well. This means that if you try to pay off the loan before the specified date, they are going to charge you a penalty fee. This is designed to prevent people from paying off their loans early and saving money on interest. These are commonly used on larger loans such as mortgages and are generally acceptable in that case. However, when you are dealing with a short-term loan such as a payday loan, prepayment penalties are something that you will want to avoid at all costs. You should have the right to pay off your loan whenever you want to without having to pay a penalty.